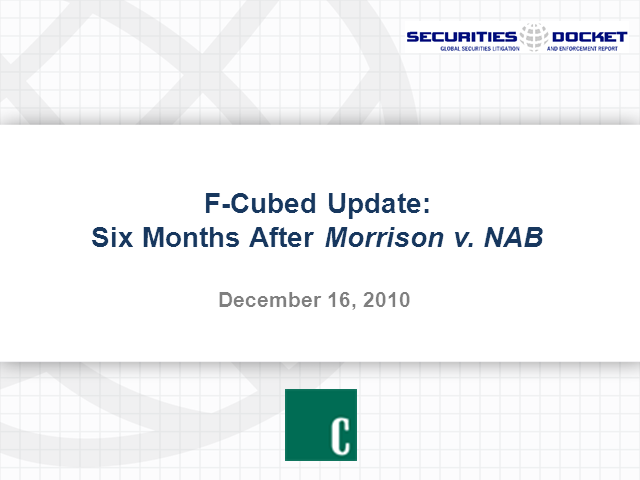 Six months ago, the U.S. Supreme Court’s ruling in Morrison v. National Australia Bank sent shock waves through the securities litigation world when it appeared to strike the death knell for so-called "f-cubed" cases brought in U.S. courts (i.e., claims by foreign investors who purchased shares of foreign companies on foreign exchanges). In fact, some have interpreted the Morrison case to also mark the end of “f-squared” cases: claims by U.S. investors who purchased shares of foreign companies on foreign exchanges. Some investors, however, have argued that Morrison does not go this far, and that it provides that U.S. courts can hear cases involving the purchase of stock on a foreign exchange if that stock is listed on an American exchange. This webcast will look at the impact of the Morrison case in existing cases such as the massive verdict for plaintiffs in Vivendi, and in over a dozen other cases now pending in federal courts around the U.S. in which the parameters of Morrison are being tested. Our panel will examine the related “extraterritorial” powers and responsibilities delegated to the U.S. Securities and Exchange Commission under Dodd-Frank. It will also take a look at whether securities class actions are influencing whether foreign issues choose to list their securities in the United States, and whether Morrison will impact this question. Please join Jordan Eth, partner at Morrison & Foerster LLP, and Adel Turki, Senior Vice President of Cornerstone Research, as they address these issues and your questions.